It seems my absence has been noticed. Messages checking everything is ok have been received – You’re too kind by the way! Everything is fine. It’s rather fantastic actually. I apologise for being MIA and my tardy commitment to my blog, but I have some news. The reason for my lack of posting is my lovely other half has popped the question and we’re getting married! Yey! Since the beginning of May intense wedding planning has taken over my life, well apart from two weeks off for a girly holiday to Italy with my mum and sister. So I’m back from holiday and taking a break from planning to post on my blog. It’s such a shame as I was so close to bringing the blog up to date with what’s been happening at Number 18, and I’m once again lagging behind! Even my old Papa commented the other day that it was about time I posted on my blog. So here I am! Back and fully committed… Well of sorts! I promise to make time for my blog and not let spending hours upon hours searching for the perfect wedding dress completely take over. So bear with me over the next few days as I try to get some pics together and write-up what we’ve been up to since I last posted. …And I don’t mean the nervous kind! I mean actual fluttering butterflies! We have had quite a number of butterflies hibernating in the house through the winter. I’ve read online that some species seek shelter in order to hibernate through the colder months, laying dormant to use little energy. Around the time the windows and doors were removed and re-sized, the weather started to get colder and the openings remained boarded up for a few months before the new windows were fitted. This is when the butterflies started arriving and on the ceiling they have remained all the way through the winter. However, spring has now sprung and a few weekends ago we were lucky enough to have a stint of gloriously warm weather. This meant the butterflies woke up so to speak and wanted to go. Before we arrived at the house unfortunately many had already died, I’m not really sure why this is as googling it has so far proved unavailing. We therefore had a butterfly rescue mission on our hands. We opened all of the windows and went round the house gently picking them up and putting them outside in a bid to set them free. I have since read that a spell of warm weather can mean butterflies come out of hibernation too early. It then occurred to me that perhaps we shouldn’t have put the butterflies outside, but they can seek shelter in other places such as sheds and tree trunks etc if the weather turns again. This weekend however, we came across a butterfly we saw many months ago and haven’t seen since. We first saw the butterfly when taking the ceilings down and out flew the butterfly from the ceiling. I have no idea how long it’s been in the house, but it was huge! We chased after the butterfly trying to get a pic but it flew away and we haven’t seen it since. Until this weekend that is! This time we managed to get a pic of it as we carefully placed it outside. 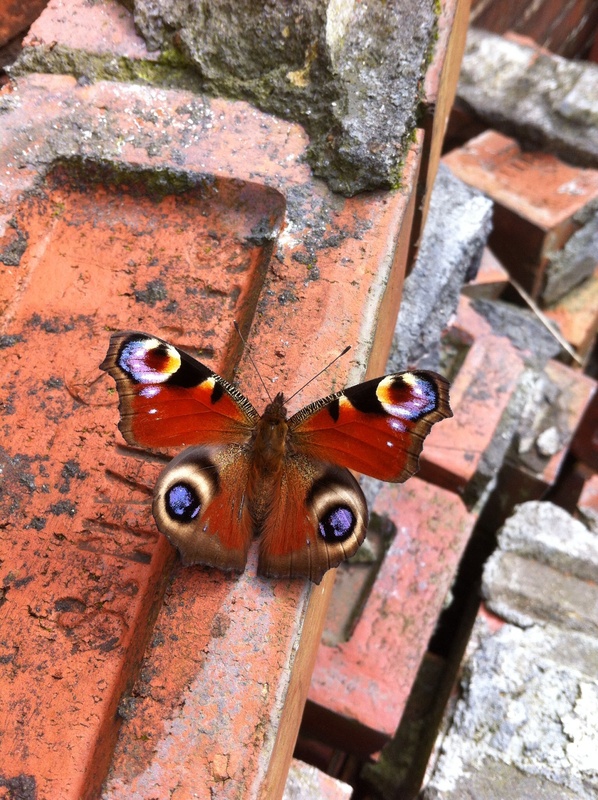 We have done some investigating online and have discovered it is a peacock butterfly. Apparently this species is a fairly common one, but I’m no butterfly expert and I’ve never seen a butterfly this size before. I’ve read the wing span range can be up to 69mm and that when under threat, peacock butterflies rub their wings together making a hissing sound which is even audible to humans. Over 12 months after picking up the keys for Number 18 and after reading many other renovation blogs, I suddenly thought I should put pen to paper (so to speak) about my own project. I, along with my partner Dan, collected the keys for our new home on 12 October 2012. Since then the project has progressed well, albeit slowly on occasion. We are now at the stage of re-wiring. Our electrician started yesterday. I will however rewind to the beginning and post plenty of pictures of what we’ve been doing over the last year and a bit.